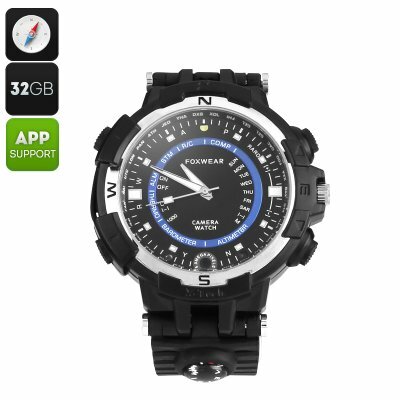 Successfully Added Foxwear FOX8 Outdoor Watch - 720p Camera, HD Video, 30FPS, 32GB Memory, Built-in Compass, WiFi to your Shopping Cart. This Foxwear sports watch is a great outdoor gadget that, with its intergraded camera, allows you to shoot pictures and crisp HD video of all your outdoor adventures. Within its beautifully designed dial, this stylish outdoor watch packs a sophisticated camera that has been equipped with an OV9712 sensor. Allowing you to shoot 720p footage and to take stunning photographs, this camera watch makes sure that not a single special moment in life ever again passes by uncaptured. Whether you’re out for a drink in town, or are enjoying a stunning hike in the wild – with this outdoor watch at your wrist, you’ll always have to means necessary to capture and share all that’s happening around you. With its WiFi connectivity, it lets you conveniently share your recordings with your smartphone, tablet, or laptop. Built-in 32GB of internal memory, you can be assured that the outdoor sports watch packs plenty of space for you to store all those memorable pictures and video’s taken during your previous holiday abroad or family birthday parties. Coming with an intergraded microphone, it is not only able to capture video but also lets you record voice and sounds at any given moment. A sophisticated 360mAh battery lets you shoot videos for up to 90 minutes continuously. Additionally, this outdoor gadget features a built-in Sony SR626SW button battery - providing two years of usage time to enjoy all its basic watch features before needing replacement. As a real outdoor gadget, this sports watch furthermore features its own compass that guarantees you’ll never get lost in the wild again. Its 3ATM splash proof design lets you use it outside in any weather condition. Whether it’s snowing or raining, nothing will stop this beautiful outdoor watch to shoot stunning footage and photographs of your upcoming outdoor adventures. Compatible with iOS and Android smartphones, this WiFi watch can be used efficiently with nearly all the latest smartphones out there.